Why Can't I Disable Quick Tabs? Ghost Browser's Quick Tabs extension comes pre-installed with Ghost Browser and acts much like Chrome's The Great Suspender, or Tab Snooze except that it's specifically designed to improve load speed when switching between Workspaces. 1. Click the Quick Tabs extension icon in the extensions bar. 2. Select the Quick Tabs setting that you want to use. Load all tabs at once: This is how Ghost Browser would work without this extension. If you have a lot of tabs in a Workspace, they will load slowly as they are fighting for resources. This option is not recommended. Load one at a time with priority given to active tab: This option opens the active tab first. This is the most productive option so it is the default. Load once a tab is made active: This option keeps all tabs in a Workspace in 'snooze mode' until you make them active by clicking on the tab. This is a good option if you'd like to minimize resources that might be taken up by inactive tabs. Load once a tab has been made active and clicked: This option is like the one above, but displays the page title and URL. When you decide that page is the one you want, you can click anywhere on the page to load it. 3. Click anywhere off of the Quick Tabs menu to close it. Your settings have been saved. Once you've selected your preferred settings, you don't need to do anything else to use Quick Tabs, it will automatically implement the load settings you selected. If you'd like to change how your tabs load, just click the extension icon and select a new setting. Quick Tabs is a custom extension designed specifically to improve load speed when switching Workspaces in Ghost Browser. Quick Tabs cannot be uninstalled or disabled as it's is an integral part of the functionality of the browser. 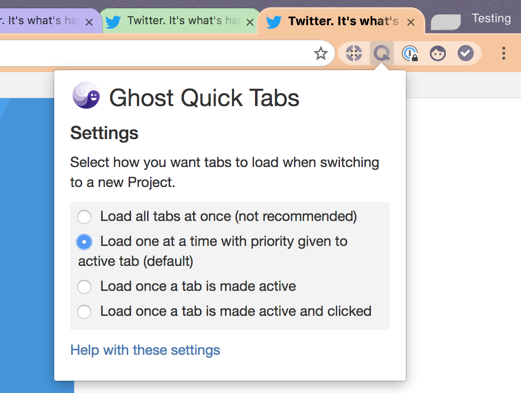 If you'd like to use Ghost Browser as though Quick Tabs was not installed, select the Load all tabs at once option in the Quick Tabs settings.